Employment Agreements | Schlueter, Mahoney & Ross, P.C. Employment agreements serve two very important purposes in today’s business environment: They protect your business interests and they protect your employees’ interests. 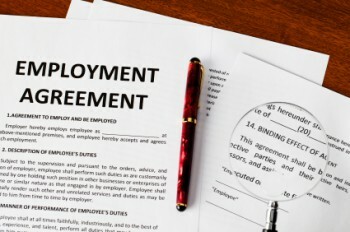 Employers have a need for employment agreements to protect business interests such as intellectual property rights and corporate confidentiality. Employees are protected by these agreements in the form of compensation and severance packages. Both sides benefit from clearly defined expectations, which include employer and employee rights and responsibilities. Because employment issues change as laws change and as the company changes in size or scope, it is always a good idea to make sure your employment agreements are updated regularly. This ensures compliance with the law and current company policy. At Schlueter, Mahoney and Ross, P.C. you will find business attorneys that are skilled at both drafting employment agreements and enforcing them. Our lawyers have the experience and skill to navigate these complex waters and create agreements that protect the interests of all parties. Well-designed employment agreements will protect your business and help it grow while at the same time taking employee rights into account. It is through this careful balance that employment expectations are defined and future conflict is prevented. However, in the event that litigation is pursued, the attorneys at Schlueter, Mahoney and Ross, P.C. are well-qualified to represent your business and pursue resolution.